The Patagonia Ultralight Felt Sole Fishing Wading Boot for Men is a Patagonia felt sole fishing wading boot for men that is designed with an upper that is made of synthetic leather with a polypropylene insole board while the midsole consists of full-length molded EVA. This felt sole fishing wading boot for men is constructed with quick drying synthetic leather that is lightweight and extremely comfortable. This felt sole fishing wading boot for men is also durable with Venergy mesh that features Bionix yards that drains quickly and keeps the sand out while you are fly-fishing. The Patagonia Ultralight Felt Sole Fishing Wading Boot for Men is designed to include long-wearing, sewn-on polyester felt sole and all the outsoles can be resoled that is a great feature of this amazingly innovative felt sole fishing wading boot for men by Patagonia. This felt sole fishing wading boot for men also contains soles that can hold fin straps if so desired. This Patagonia Ultralight Felt Sole Fishing Wading Boot for Men also features a traditional front lace system which contains quick drying laces. 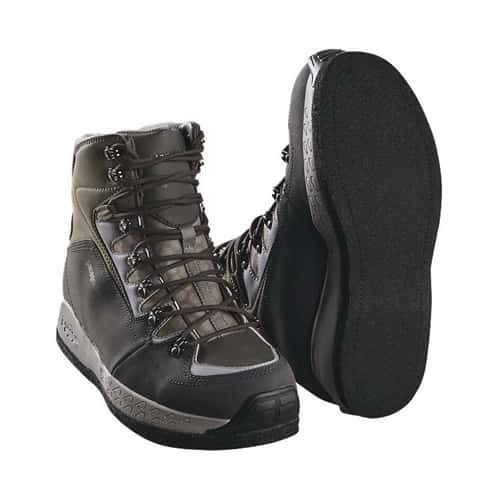 This felt sole fishing wading boot for men also features an internal upper support and a reinforced toe box that resists water pressure when you are deep wading. This felt sole fishing wading boot for men is great to wear on slippery or rocky bottom surfaces, so make sure to check out this very innovative Ultralight Felt Sole Fishing Wading Boot for Men by Patagonia for your next fly-fishing getaway. These Patagonia Ultralight Wading Boots - Felt fly-fishing boots are very comfortable to wear and definitely keep my feet nice and dry while I'm fly-fishing. The felt soles are also excellent and grip slippery rock surfaces wonderfully. Not only that, but the price is great too as the quality of these Patagonia Ultralight Wading Boots is outstanding. They also feel really nice to wear and they look great as well. They definitely check all the right boxes for me, that's for sure, so check out these Patagonia Ultralight Wading Boots now!